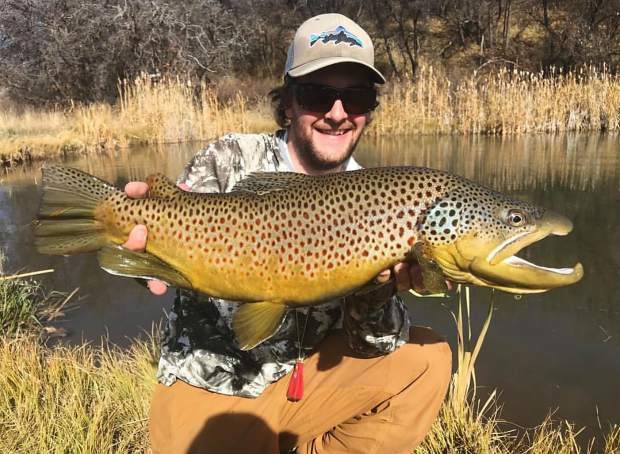 Woody Boughten proudly displays a huge brown trout caught at the Bar ZX Ranch near Paonia. So, you’ve hooked a huge fish. Now what? What happens next determines the outcome of this much-sought-after scenario. Most big fish have gotten that size because they have figured a few things out in regard to their survival. They are not afraid to roll like an alligator, swim straight into a brush pile, saw your leader back and forth over sharp rocks, or simply dump your reel as they swiftly relocate to another area code. You have to take charge from the get-go. Most big ones have two or three runs in them, and if you are patient enough, you can win this cat-and-mouse game. Many things are out of your control, but there are techniques that can tilt the odds in your favor. First, you need to go where the fish goes. Standing your ground as the fish zooms up or downstream rarely works out in the angler’s favor. Move with the fish so you are on the scene when it tires. Keeping the line tight is very important; you need to apply the built-in leverage of your 9- or 10-foot rod, keeping your tip up in the air. When casting to that bigger fish, take the time to retie fresh tippet in the heaviest diameter you think you can get away with. Your ultra light 6 or 7x probably won’t get the job done and isn’t very kind to the fish (because you will have to over-play them). A special fish requires extra attention and planning on your part. Besides moving with the fish, keeping pressure on them and using the appropriate tippet, a longer handled net will seal this deal, especially if you are alone. Aim for the trout’s head with your net, and get it over with quickly. Another good thing to keep in mind is to only fish with as much line out as you need. Many a nice fish has been lost because the angler has 40 feet of line piled up at their feet. Hooking and losing a whopper usually ends with a few choice words and a dose of self-doubt, but if you believe in yourself, respect the fish and do the work, the odds will begin to play in your favor. Usually.